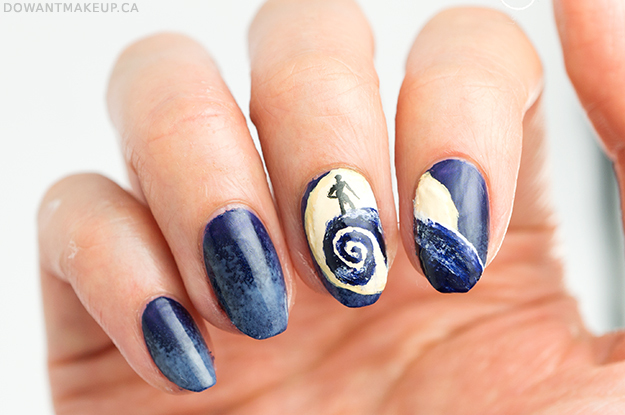 Believe it or not, I hadn't actually watched The Nightmare Before Christmas until very recently. The movie came out over 20 years ago and I knew the gist of the story, but I only watched it for the first time last year! It really is a fantastic movie and I understand why it's so iconic. 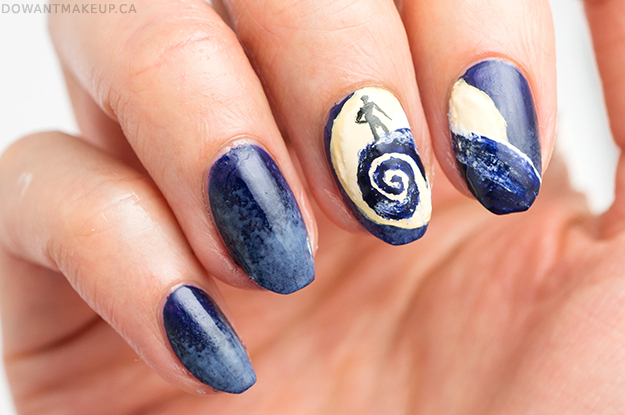 For the base, I used just one coat of China Glaze Up All Night, an inky indigo. I sponged a bit of OPI Funny Bunny on top for a misty look. Spiral Hill (or Curly Hill, I'm not sure of the official name) is also done with Up All Night, with some quick shading using white acrylic paint dry-brushed on. 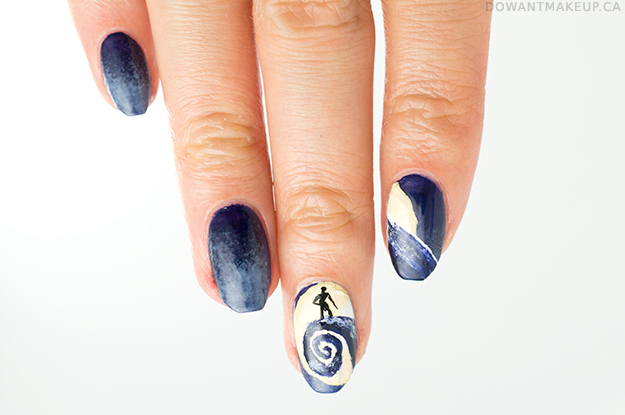 The moon and silhouette are also acrylic paints. I know Jack's silhouette should be much longer and leaner, but I painted the moon and the hill first and ended up not leaving enough space for Jack D: Maybe I should just paint on to my skin next time? BISC Vol. 18: What’s the worst thing anyone has ever said to you about your blog and what was your reaction? What’s the worst thing anyone has ever said to you about your blog and what was your reaction? To be honest, only a few selected people in my personal life know that I blog, which is probably why I rarely face negative comments. After all they are friends and family and supposed to be supportive, no? In an argument, Mr. Loca once told me he couldn’t understand why “Someone as intelligent as I would waste my time on something as superficial as writing about makeup” (my father would probably agree on that), but after we got past the slamming doors part, he apologized. Beauty may be superficial to some, but it is so much more than makeup. I don’t know if anybody has said anything negative to me about my blog, to be honest! People tend to be curious rather than critical. Bf has told me that I come across much more cheerful/happy on my blog than I actually am in real life, but I think that is more of a comment on my personality than my blog… ಠ_ಠ My reaction: of course I’m more cheerful on my blog; I get to talk about stuff that I love and excites me! My experience is very positive, thank heavens. I have received some emails before, saying that I’m ugly and really, I’m secure and mature enough to laugh it off. I don’t know why, but it just cracked me up. I remember a fellow blogger say that you know you’ve made it when you get hate mails. Hahaha! In all seriousness though, my genuine readers have been awesome. I get chats on Facebook, Twitter and even emails, and they’re the sweetest people on earth! I have never had anyone say anything really bad or hurtful about my blog so I consider myself lucky! However, one of my friends, after he found out I had a beauty blog, said to me that I became so vain writing about lipsticks and makeup. It was a little hurtful but I explained to him that a beauty blog is more than just writing about makeup, it’s a way of expressing your creativity and connecting with other wonderful people who share the same interests as you as well as passing your knowledge and skills to others. Honestly, no one’s ever said anything really terrible about my blog to my face… But hey, who knows what they’ve been saying behind my back! Back when I first started Hello Jaa (only a month into it I think), someone commented publicly that I was trying to be like Temptalia and told me to “be original”. I was slightly upset (since I would never copy anyone ever) but decided to just brush it off. I know what I’m doing and I think over time I have proven that Hello Jaa has its own style in terms of writing, format, and photography. One time I was also told that I used too many English words in my Thai translations so I’ve been improving on that and trying my best to translate every word into Thai. There is also a thread mentioning that my reviews can’t be trusted because I came out of nowhere and started reviewing all these expensive makeup. Trust me, I always disclose when I receive product samples! Other than that, everyone else has been really nice to me and my blog. I’ve even become good friends with so many of my readers. Two coats of China Glaze Love Letters, a translucent rosy shade that enhances the natural colour of my nail beds (think MNBB--my nails but better!) 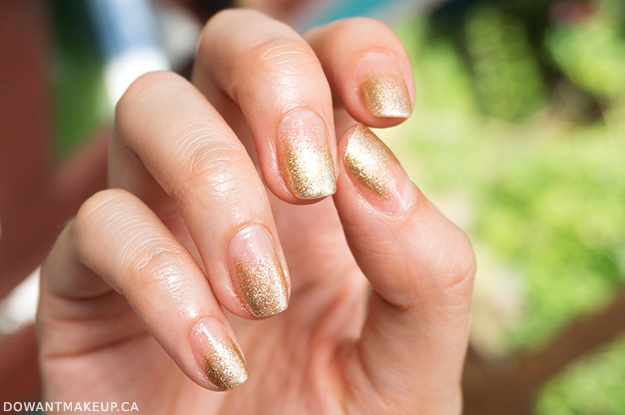 I sponged on 1-2 layers of Orly Luxe to make a simple gradient, and that's it. 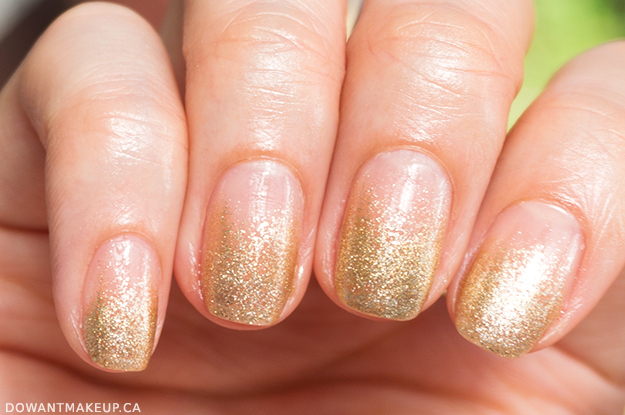 There's an extra reason for doing a "naked" nail look: I was going to be in Hawaii for nine days and my nails grow fast. 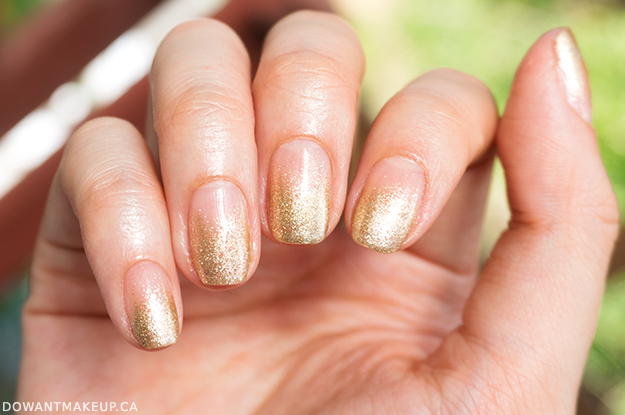 With this, I didn't have to worry about removing my polish and I wouldn't get that "grown-out" look where there's an obvious gap between your nail polish and new nail growth. Korean makeup and skin care seem to be the new hot thing right now, and with its focus on fresh, dewy skin, I can't blame Western markets for wanting a part of that! I used to order Korean beauty products through online retailers like Sasa and just hope for the best, but now Sephora is bringing in Korean brands like AmorePacific, Too Cool For School, and Laneige. That means I can play with products in store and buy with a little more confidence, knowing I can return it if it doesn't work out. 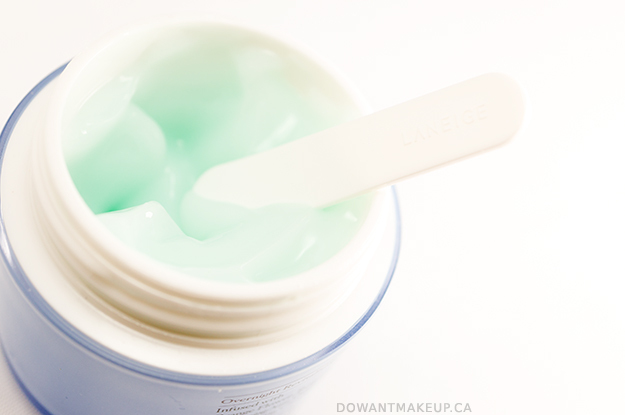 One thing I'm definitely not letting go of though, is the new Laneige Water Sleeping Mask! 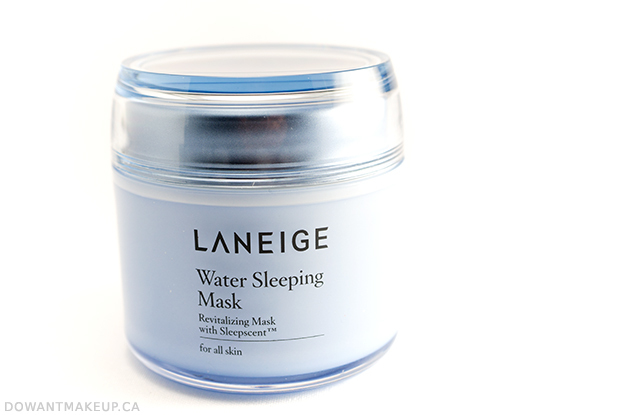 I had heard a lot of buzz about Laneige's sleeping masks and packs in the past, so I was really excited to receive the Water Sleeping Mask through Influenster. This overnight mask promises to refresh and revitalize skin while you sleep, while also soothing with Sleepscent, a blend of orange flower, rose, and sandalwood scents. It even looks relaxing, with the colours of the periwinkle jar and pastel mint green product inside. It has a lightweight gel texture that glides over the skin easily and absorbs quickly into my normal/dry skin. While I find that the hydration level is just right for my cheeks, my drier forehead area felt like it needed a second application of the Sleeping Mask or another product on top. If you found Clinique Moisture Surge Overnight Mask to be a bit heavy for your skin type, this one might be just right for you.